The BlackBerry has finally caught up to the world of touch-screen smartphones. It took time - six years, from the launch of the first iPhone - and it may be too late to save the company that makes it. But the BlackBerry deserves to be taken seriously again. Why? Because the new BlackBerry Q10 is a successful marriage of the modern touch-screen smartphone and the iconic BlackBerry keyboard. Though it can be hard to remember, the keyboard used to be a standard feature on smartphones, before the iPhone wiped out minds with its vision of touch-screen Utopia. Since then, keyboards have been disappearing from smartphones. Physical keyboards just didn't fit into the design mold set by the iPhone. Palm Inc. created a credible, innovative smartphone with a physical keyboard, but it was a slide-out version, which made the keyboard seem like a burden and an afterthought. There have also been Android phones with physical keyboards, but they haven't been very good, and they've mostly disappeared. Meanwhile, BlackBerry has continued to make well-designed phones with physical keyboards. But until now, it hasn't gotten the software running them quite right. Even with physical keyboards, modern phones need touch screens to control movies, games and other tasks beyond the BlackBerry's roots in messaging. BlackBerry has experimented with touch screens, but has been partly hamstrung by the pre-touch foundations of its operating system. After numerous delays, BlackBerry finally came out with a modern operating system this year, the BlackBerry 10 ( Click on category to see the review ). The company considers it crucial to its future, as the BlackBerry seeks to recapture relevance lost to the iPhone and Android devices. RIM's first phone with the new software, the BlackBerry Z10, is a touch-only device. With the Q10, we really get to see how it works with a keyboard. On BlackBerrys, the keyboard has always been about more than filling in text fields, and the new operating system takes that further. If you want to send a tweet about what you're eating for lunch, just pick up the phone, unlock it and type"tweet Turkey sandwich again today." Hit Enter, and now the world knows about your boring fare before you've even had a bite. 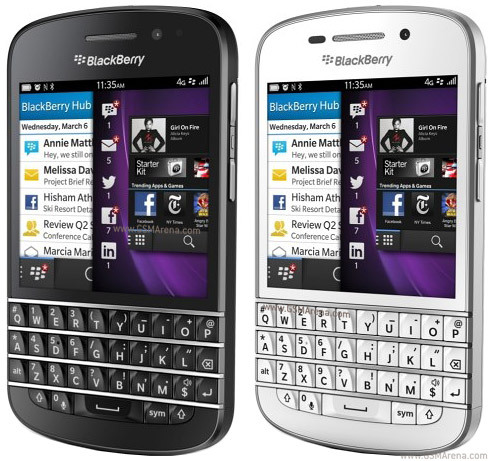 Just as you can on some older BlackBerrys, you can also launch applications by typing. If you want to play "Angry Birds," instead of flicking through screens to look for the icon, you can just start typing "Ang" and the game icon pops up. Again, that's fast. The keyboard is handy for music, too. If you're in the apps screen, just start typing the name of the song or artist you're looking for, and up it comes. I haven't used a keyboard-equipped phone in years, but the Q10 makes it very tempting. There's no getting around it: it's faster, more accurate way to type, even compared with innovations such as Swype, which lets you "type" by swiping your finger from letter to letter. The keyboard eats up space that could be devoted to a bigger screen, of course. But BlackBerry has saved some space by eliminating the big buttons that resided between the screen and the keyboard on older BlackBerrys. This results in a larger, square screen. It's very sharp and colorful, too. To some extent, the screen compensates for its small size with a high resolution, which allows it to present a lot of information, as long as you're willing to hold it close and read small type. U.S. phone companies haven't yet said when they'll sell the Q10, but expect it by the end of May for about $250 with a two-year contract. It's coming to BlackBerry's home country of Canada on May 1. 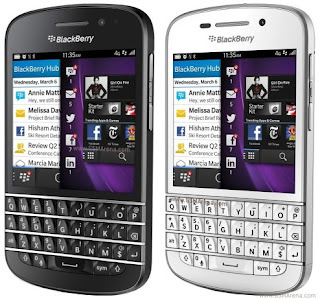 The BlackBerry 10 software made its debut a few months ago on the touch-only Z10. The new operating system is a welcome change, not just for BlackBerry users. It's very quick to get around the phone, and it seldom leaves me baffled the way many incarnations of Android do. It's laser-focused on giving you access to email, texts and other means of communication, as opposed to music, movies and games. One of the coolest features is the"peek." From any application, you can swipe your thumb up from the bottom of the screen, then right, to slide the application slightly off the screen. That reveals the messaging "Hub," which gathers your communications. At a glance, you can see which accounts have new messages. If you want, you can slide the app farther to the right, getting you into the Hub to read and write. Swipe left, and you're back to where you were. The interface takes time to get used to, and it doesn't have the simple immediacy of the iPhone. But once you learn it, you can positively zip between tasks. The downside to the new operating system is its relative death of third-party software. There are applications for Facebook, The New York Times and The Wall Street Journal. 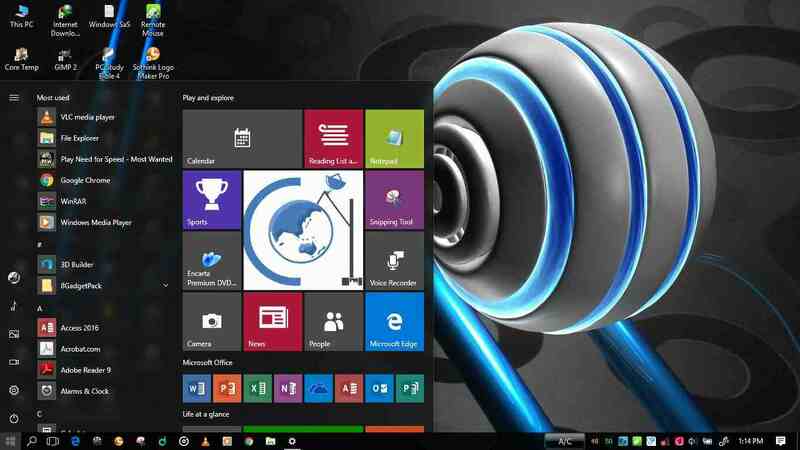 A Skype app out will be out soon.